The Day I Saved the World! When your students read this exaggerated tale, they will find a tonne of hyperboles! Get plenty of practise with alliteration by identifying and creating alliterative sentences. This graphic organizer helps your students examine descriptive adjectives and nouns. Use this glossary with the EL Support Lesson: Making Alliteration Accessible. 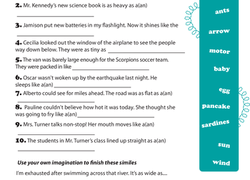 Use this worksheet to help students identify personified nouns and their respective verbs. Use these vocabulary cards with the EL Support Lesson: Poetic Personification. Use this glossary with the EL Support Lesson: Poetic Personification.